“What the soul is in the body, this is what Christians are in the world,” says the Epistle to Diognetus. Nobody demonstrates the truth of that more than Fr. Paisius Altschul of Troost Avenue in Kansas City, Missouri. Fr. Paisius was recently recognized by the city for his efforts, which include more than two decades of work with the city’s poor and disenfranchised. Which of our mayors would say that of our pastors? Fr. Paisius is the priest of St. Mary of Egypt Orthodox Church and the founder of Reconciliation Services, a ministry that offers desperately needed counseling, material aid, medicine, and job training. Beyond these efforts, Fr. Paisius has brought a sense of history and local pride to his long-troubled neighborhood, something also recognized by the mayor. I was privileged to spend some brief time at St. Mary of Egypt and Reconciliation Services in 2009 and saw Fr. Paisius in action. I left deeply moved by his spirit and impressed by his work, which were mirrored in lives of many people who labor there. Almost palpably it felt like a loving place, like a gracious place. The Holy Spirit touches souls in many ways, and you need to make many different avenues available, whether through church services, reading, bible study, or social outreach. Let’s just live the life of Christians and see who the Lord gathers. . . . [B]eing with people is pretty sacramental for me. I think a lot about the iconic view of a person. When you are with another person you discover how the Holy Spirit is working there, and if you pray with them, it’s wonderful to see what’s already taking place. Though recently handing the reins of Reconciliation Services to Fr. Justin Mathews, Fr. 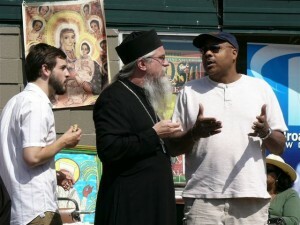 Paisius remains an active and inspiring presence in the community — part of the soul of Troost Avenue.